Callaway Henderson Sotheby’s International Realty is the premier real estate brokerage firm in the Greater Princeton Area, with results that speak for themselves. 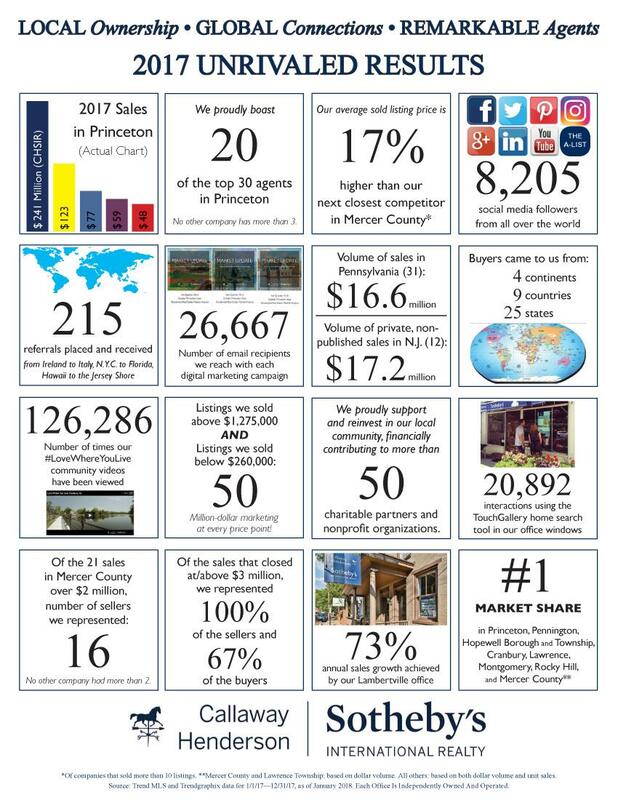 In 2016, we achieved #1 market share in Princeton, Pennington, Hopewell Township, Lawrence, Montgomery, and Mercer County as a whole. Our average sold listing price was 74% higher than our next closest competitor in Mercer County. Source: 1/1/16 - 12/31/16 Trend MLS and Trendgraphix data for Princeton and Mercer County as of Jaunuary 2017. *Of companies which have sold more than 10 listings in Mercer County. Since 2001, of the 71 sold properties in Trend MLS priced above $3 million, agents with our company have represented 59 of the sellers (83%). No other company had more than 4 (6%). Since we combined companies in January 2012, of the 109 sold properties priced above $2 million, we have represented 88 of the sellers (81%). No other company has represented more than 4 (4%). We have also represented 62 of the buyers (57%). No other company had more than 11 (10%). Source: Trend MLS sold residential properties in Mercer County, Montgomery, East and West Amwell, as of 12/31/17.